Menu/MBK is Chef Frederik De Pue’s second attempt at reviving the old Café Atlántico space in Penn Quarter. He shuttered his seafood-themed Azure six months ago and reimagined the four story space into a layer cake of culinary delights. The ground floor of Menu/MBK features a Market open 9am to 9pm for gourmet grocery items, prepared foods, fancy sandwiches and coffee to go or to enjoy with free wi-fi on the third floor living room lounge. At 5pm the lounge and forth floor dining room become BistroBar, serving Belgian inspired beverages and thoughtful European fare. The frosting in the middle is the second floor open Kitchen with a six-seater chef’s counter serving a special prix-fixe menu that changes daily. On that particular Saturday night, we were led up to the top floor via the service stairs, avoiding the large private party at the bar. 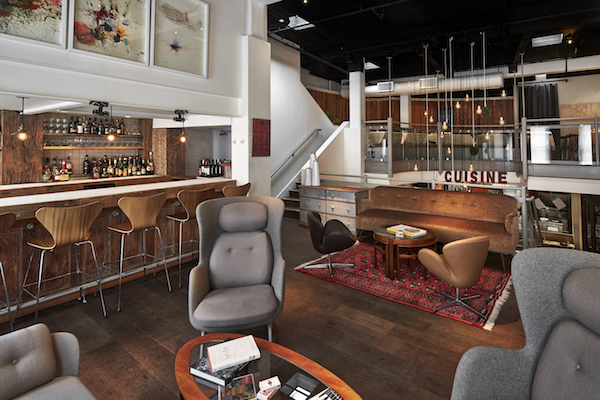 The view from up top reveals eclectic decor with a homey, loft feel. Bare bulbs and bird cage assemblages dangle down the central cavity as if inspired by Maurizio Cattelan’s 2012 retrospective installation at the Guggenheim, NY. We were seated and perused the drink list for what felt like eons until a server finally approached and opened with an apology. They were out of the three signature cocktails Miss Oreo had her eye on, and beverage service was likely to take longer than usual due to one bartender and a thirsty bar crowd. The Bistro menu is small (literally…the card could fit in my back pocket), and divided into price categories ranging from $8 to $34. I asked the server if he would mind going through the gluten-free options with me and he preferred I ask him specifically about the dishes that interested me. I was interested in everything. He seemed fairly knowledgeable, but proceeded with caution, looking at me wearily after every “you can’t eat that”, as if I my head might implode after too many disappointments. To his relief, we managed to find some gluten-free options that appealed. We started off easy with a cheese and charcuterie plate that arrived with three sad looking toast corners on the side, one for each wheat-bellied guest. Sensing the table’s dissatisfaction the server quickly supplemented with more toast. We slowly nibbled, waiting an uncomfortable amount of time before we saw our server again to place our food order. He asked my three dining partners if they would like homemade parker rolls with bits of bacon baked into the center, as if any gluten and pork-eating American would say “no” to that! 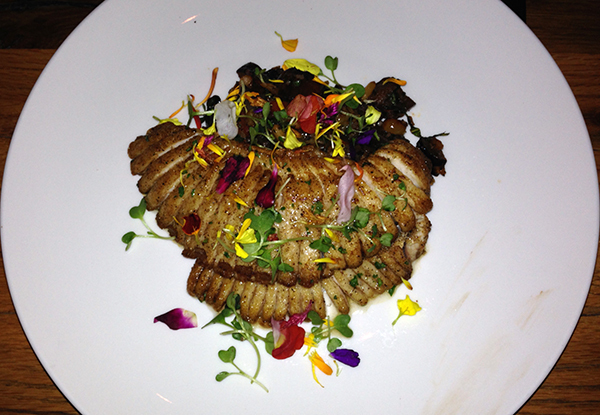 As our main course was served the Chef De Pue I know and love from Table finally performed. Mr. Oreo and Mr. Green Bean both ordered the Chapel Hill Farm Veal Meatballs with panisse (chickpea fritters, though not gluten-free here) and cucumber mostarda. The masculine dish was plated daintily and apparently tasted “really, really good”. Miss Oreo’s Crispy Cod with lemon parsley remoulade and fennel looked and tasted just as our server had described/warned: like a fish and chips egg roll. According to Miss Oreo, the rolls’ potato and fish filling could have used some classic tartar sauce to combat the dryness. Neither dish was fair game for my fork. Luckily I was perfectly happy with my Artic Char, served skin-side-up over artichoke hearts and diced vegetables in a light broth with dabs of what the menu calls “lemon puree”, but I call butter. 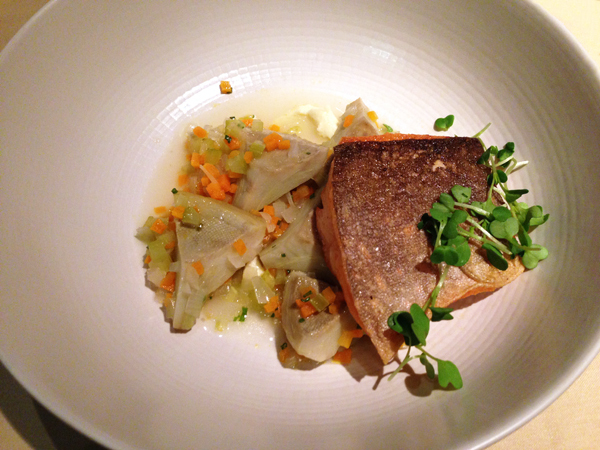 The fish was delicate with a crispy skin and mild flavor that allowed the artichokes to shine. We were enjoying the last bites of our entrées when our server reappeared to apologize for the tardiness of our Peas and Carrots side. Once they arrived, it was clear they were worth the wait. These buttery, plump, green peas with carrot and potato slices redefine the TV dinner’s most common filler. Pre-dessert we spent a few minutes analyzing how Miss Oreo and Mr. Green Bean’s second round of tea-infused, beer and gin based cocktails varied significantly from their first glasses and didn’t quiet resemble each other either. One bartender, really? I ordered a coffee for my second round and finished the mug before the milk appeared (they were out of cream). I was quickly distracted by the dessert menu’s Sundae with caramel popcorn and nougat ice creams, Coca Cola sorbet and peanut brittle. Our server was happy to finally bring some good news: the sundae could be served gluten-free without the unnecessary cookie crumble garnish. Of course, it was delivered with the glutenous crumbles anyway and soon disappeared to melt sadly in the kitchen while an actually gluten-free version was prepared. 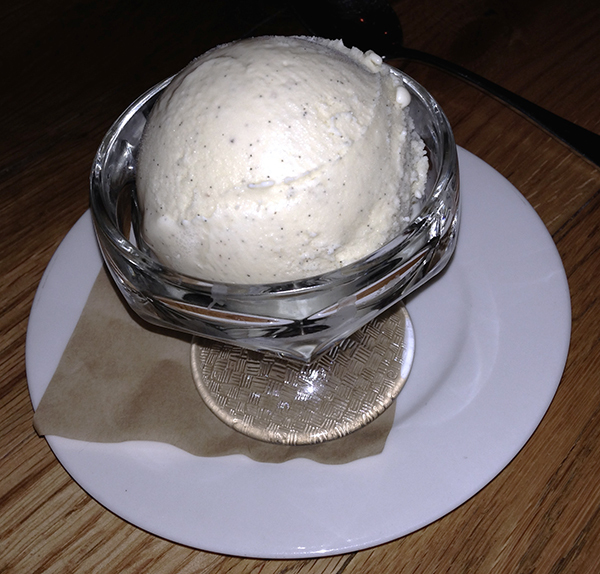 The ice creams and brittle were unanimous winners while the sorbet looked and tasted more like a 7-Eleven Slurpee. We ended the evening filled with good food but a bad taste in our mouths. Even after all the hiccups, not one reparation was made. 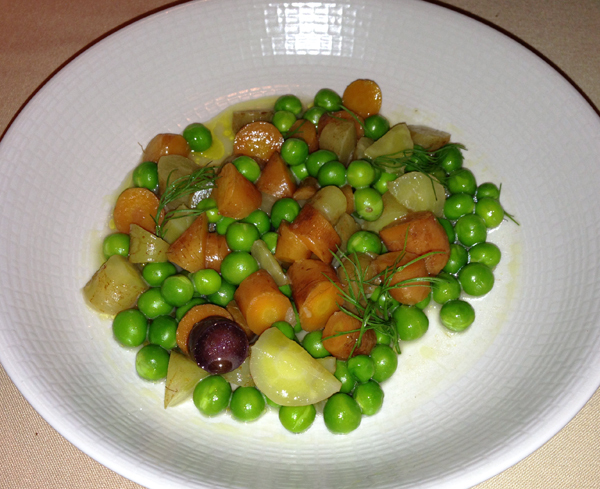 A simple courtesy dessert or on-the-house peas and carrots would have spoken volumes. Instead I am left to hope that Menu/MBK was just having a bad night but fear that De Pue’s recipe for this multipurpose space has a couple of bad eggs. Categories: 2 Spoons, American, Bar, Belgian, Comfort, Dessert, Dinner, European, Gluten-Free, Local, Lunch, Seafood, Seasonal, Washington DC | Permalink. I can cook. I can paint and draw too. However, I am a much better spokesperson for others’ artistic creations. So, nearly two years ago when Glutie Foodie was born, I chose to write about my adventures in restaurants rather than in my own kitchen. 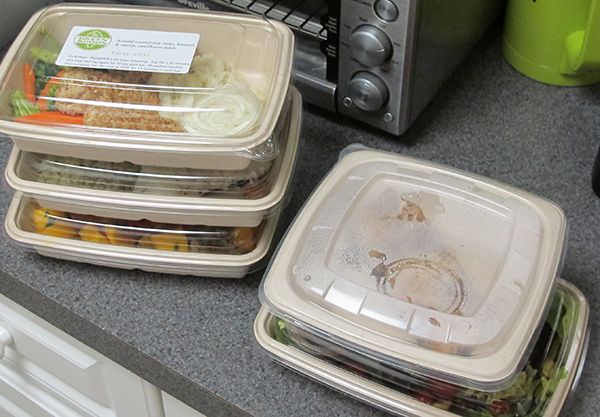 That was before The Green Spoon came to town, an Arlington based upstart delivering chef-cooked, gluten-free, healthy meals to local living rooms within hours of their preparation; now that’s a TV-dinner worth writing about. The Green Spoon’s founder and owner, Hanson Cheng, grew up on gourmet food with his family in the restaurant industry. It was not until he benefited first-hand from a strict Paleo diet that he realized the positive affects of healthy, clean eating and his mission became clear. Cheng explains, “People in DC work hard, sit for hours in traffic, have families, have schedules so packed that they barely have time for themselves or their families. If I could help people eat great food and make it convenient for them, I felt that would be very valuable….They would have access to healthy food that tastes great! From the first taste of a Green Spoon meal, Souliyadeth’s talents are clear. He is a pro at preparing well-balanced, packaged meals that taste as delicious re-heated the next day as they would right off the pan. Souliyadeth shops for his locally sourced produce and proteins once the week’s orders are in, to ensure the freshest ingredients with nearly no waste. 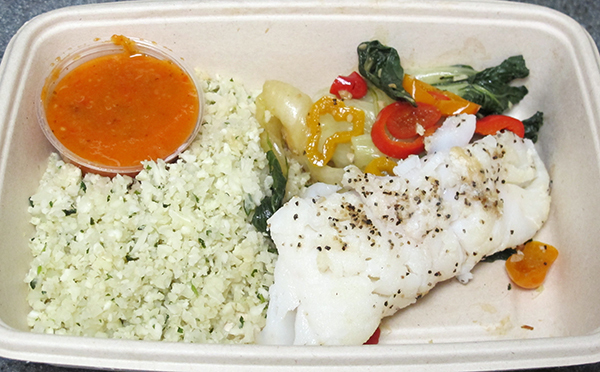 The seared haddock with a “soy sauce” glaze, cauliflower rice, baby bok choy and sweet peppers spent 15 minutes in my 350 degree oven, right in the eco-friendly container in which it was delivered. Another 15 minutes later, that container was licked clean, tossed into the recycling bin and I had the rest of my night to…well, work on this post. 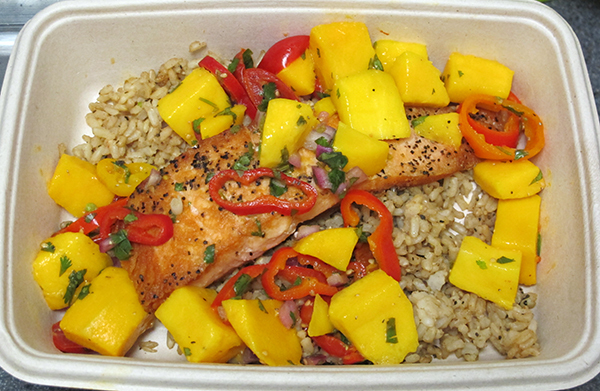 The salmon filet I received was served with a mound of sweet and tangy mango salsa atop a bed of brown rice that crisped on the edges after its 15 minutes in the oven. 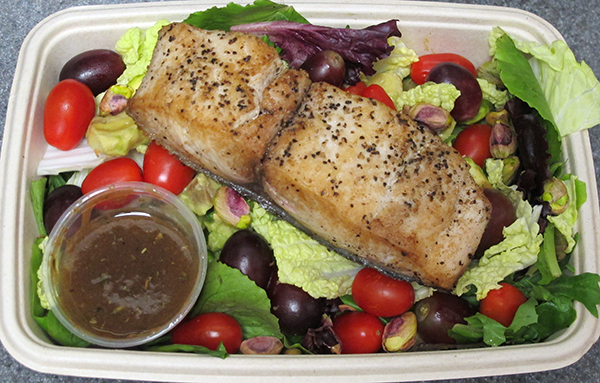 The lunch menu’s napa cabbage salad with grape tomatoes, red grapes, pistachios and avocado was accompanied by a hearty portion of mahi mahi and a balsamic vinaigrette that Mr. Green Bean and I nearly drank! We spent the entire meal trying to figure out how to replicate our new favorite dressing. The Green Spoon caterers to little people too, with a separate kids menu that tempts the Mr. Green Bean in all of us. 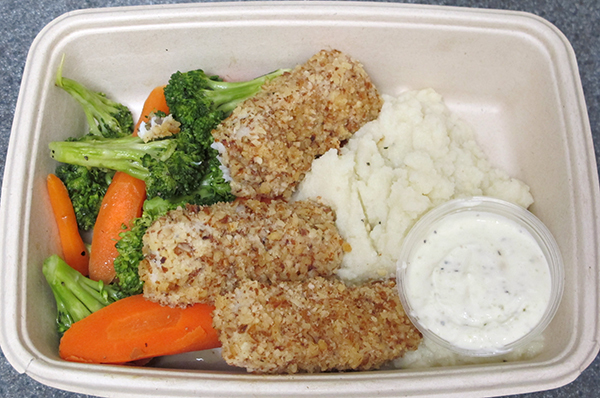 I was particularly intrigued by the almond crusted fish sticks served with broccoli, carrots, and a cauliflower mash that kids will never know isn’t the starchy staple they’re used to. The accompanying tartar sauce tasted so fresh I actually felt good about eating it. Beware that this finger food is meant to be eaten with a fork, due to the fish’s delicate texture. In fact, all the fish portions were cooked to a perfect, flaky consistency after their second rounds in an oven, a virtue I wish I could replicate with my own leftovers. It was a week filled with fish, as you can tell. Mr. Green Bean was a good sport to put up with the fresh ocean smell that engulfed our apartment. Our Kashrut observance prohibited us from bringing in dishes like the Green Spoon’s Jerk chicken with sweet plantains and spanish brown rice, or Kofte (Meditteranean meatballs) with tzatziki, chickpeas and spiced spinach, which my husband surely would have loved, and I have no doubt make for delicious dinners. Though The Green Spoon sought me out to taste test their cooking, I am a new fan of the company on my own volition. I am convinced after tasting multiple dishes that what I initially thought were steep prices for “take-out” meals ($13 per lunch and $17 per dinner), are more than fair considering the product’s quality and quantity. The Green Spoon makes major efforts to support organic, local, and sustainable farming as much as possible and has no minimum order requirements or membership fees. Orders are taken the week before they are cooked and delivered, and meals are meant to be eaten within a couple of days of their arrival. 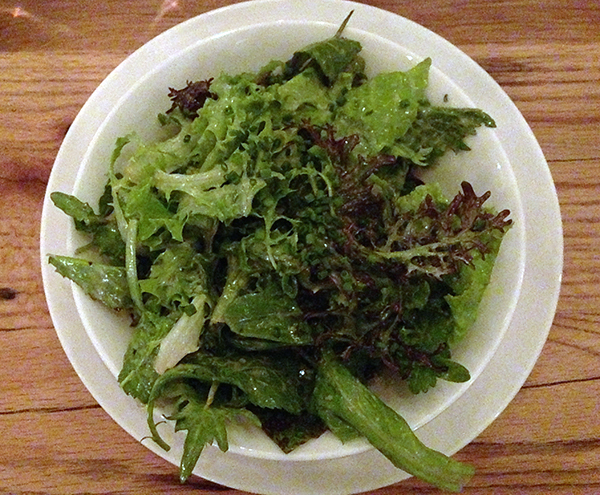 Hanson Cheng has big hopes for The Green Spoon, and there certainly is room for growth. The company is working on marketing the gluten-free, clean eating philosophy more prominently on the website and has plans to add organic juices, designed by a top DC mixologist, to their repertoire soon. Not surprisingly, there are still some limitations for the young company: While customers can list allergies on their user profile, specific food needs other than gluten-free are subject to the week’s offerings and may not be able to be accommodated. Delivery is currently only available in NW DC, Arlington, and Old Town Alexandria. Cheng hopes to expand the delivery radius once the kitchen can support the expansion without compromising quality. But anyone is welcome to our apartment where The Green Spoon will be making regular delivers from now on. Categories: 4 Spoons, American, Comfort, Dinner, Gluten-Free, Local, Lunch, Organic, Seafood, Seasonal, Virginia, Washington DC | Permalink. Glutie Foodie is on the job! 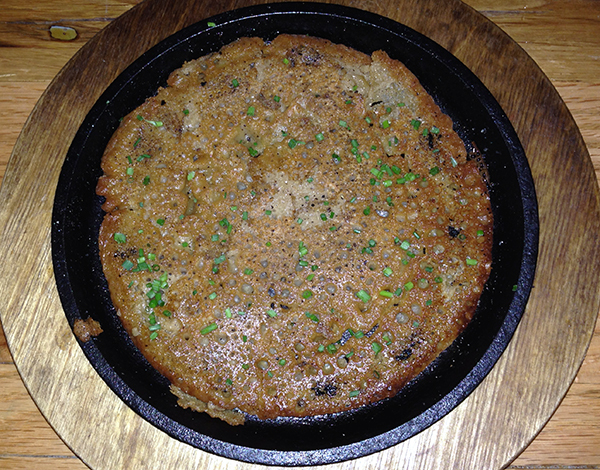 Read this month’s issue of On Tap Magazine for the Gluten-free Griddle Report, where Glutie Foodie reveals the area’s best gluten-free pancakes. Quinoa, buckwheat and rice flour batters offer something special for brunch, lunch and even dinner. Get the full report HERE. Let us know what you think and if there are other g-free flapjack shacks gluties should know about. Categories: American, Baked Goods, Brunch, Dinner, Fast food, French, Gluten-Free, Local, Lunch, Maryland, Organic, Vegan, Vegetarian, Virginia, Washington DC | Permalink. It took two years, but I finally recalibrated my taste for pizza. Gluten-free pies are readily available in the DC region, I can’t complain about that. But a crust made from rice, chickpea or sorghum flour is just a different animal than its wheat-based counterpart. Gluten-eating sympathizers will often compare and acknowledge that g-free is “not bad” or “actually pretty good!” But that “pretty good” pizza is mine forever. Now, when I crave pizza, I salivate thinking about the thin, delicate and often soggy kind. How delish. 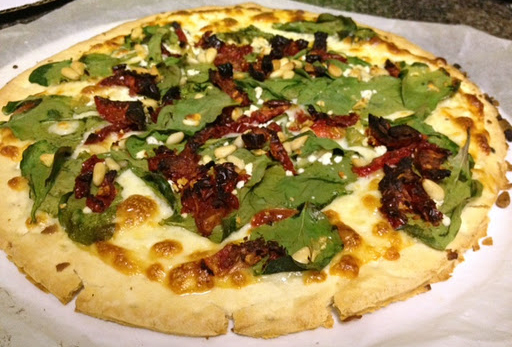 One of the better options around town is the gluten-free crust at HomeMade Pizza Co. The DC and Illinois based company is unique to begin with. Gourmet pizza’s are prepared in-house using fresh, locally-sourced ingredients, and packaged with instructions for baking at home. It’s brilliant, actually. After 15 minutes in the oven you have a piping hot pie that taste like a lot more at-home labor. The HomeMade Pizza Co. menu allows customers to build their own pie if the pre-curated combinations don’t strike it just right. Start with a choice of crust (regular, whole wheat, deep dish or gluten-free), then add a base (tomato sauce, olive oil, BBQ sauce, ranch, pesto), and a selection of toppings from cheeses to meats, vegetables and herbs. 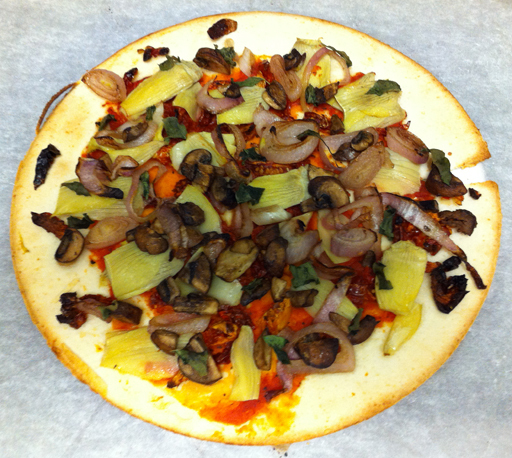 The gluten-free crust, offered since 2011, is comprised of rice flour, tapioca starch, potato starch and corn starch. The dough is prepared, rolled out, and sealed in an off-site, certified gluten-free kitchen, then delivered to HomeMade locations to be topped off. Unfortunately the tiny storefronts do not accommodate separate work stations. While staff is careful to keep gluten-free crusts contamination-free, a thin coating of wheat-flour dusts even the cash register at the 14th Street location that I frequent. If I appear antsy when I pick up my orders it’s because I’m anxious to get back outside for a full breath of fresh air! At least the baking takes place in the safety of my own kitchen. Mr. Green Bean’s cheese pizza (sometimes on whole wheat to justify eating a slice too many) goes on the bottom rack. My HomeMade favorite, the Spinach Pie with feta cheese, sun-dried tomatoes, roasted garlic, pine nuts, Kalamata olives and oregano over an olive oil glaze, sits daintily on the top. The result: well, thin, of course, with a crispy “crust” (indistinguishable from the rest of the pie, except that it’s topping-less) and a light, buttery flavor. Toppings are fresh, plentiful, and easily modifiable (think light-on-the-cheese, extra saucy or added anchovies for free). Rated relative to other gluten-free pies, HomeMade definitely wins a spot on my fast food rotation. However, the company should make some improvements to avoid cross-contamination and control the wafting flour that us gluties avoid like second-hand smoke. 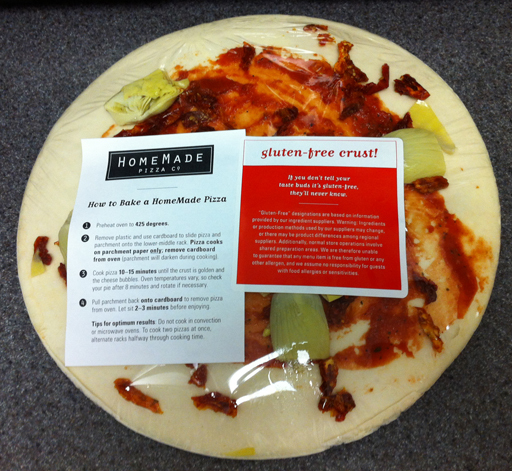 HomeMade Pizza Co., various locations in Washington DC and VA. Categories: 3 Spoons, American, Comfort, Dinner, Fast food, Gluten-Free, Local, Pizza, Vegetarian, Virginia, Washington DC | Permalink. My birthday rarely goes unnoticed, thanks to Mr. Green Bean’s love for throwing parties in my honor. This year I somehow convinced my husband to let me fly under the radar. On the evening of my birthday, we found ourselves wandering around town in a Car2Go, hungry and hoping to feel inspired. We were in front of a very dark Red Hen (closed on Monday nights) when I realized it would be the perfect occasion to try Kapnos. Mike Isabella’s newest Greek-inspired mezze restaurant was pleasantly quiet, and we jumped at the opportunity to sit at the chef’s counter overlooking sauté pans, prep stations, and two pigs rotating slowly on spits. It just so happened to be the sous chef’s birthday as well. I felt a pang of guilt for celebrating while he worked and silently hoped he wouldn’t sabotage our food. At first glance, the interior of Kapnos has that ever-popular, industrial-chic look. But a closer examination reveals embellishments such as arched niches, lamps, tchotchkes and floor patterns inspired by ancient Greek designs. The menu draws from Northern Greece, focusing on spreads, an abundance of vegetable mezze, and wood roasted and spit-roasted meats. 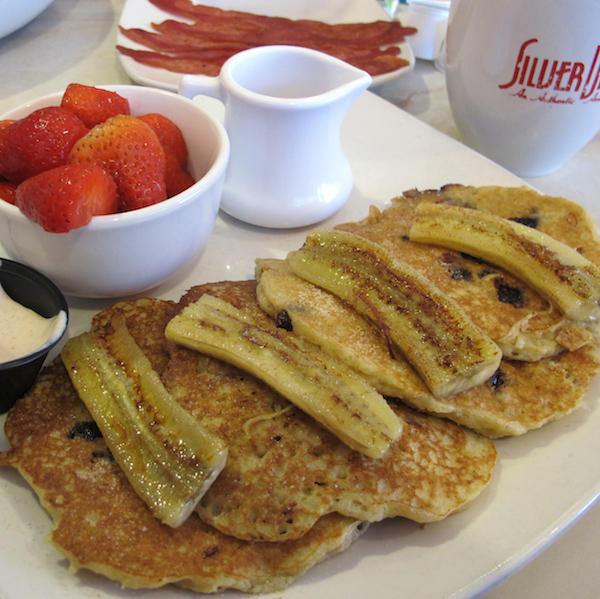 Servers are well informed and trustworthy guides through a menu that is largely gluten-free. I assuredly let down my guard after making clear my limitations, knowing whatever we ordered would be properly modified to meet my needs. Our server proved herself when she retracted our order of Greek Fries after checking on the contamination in that day’s oil bath, saving me from morning after birthday woes. We started with Mr. Green Bean’s favorite Greek dip, Tzatziki, and Kapnos’ take on hummus, Revithosalata, made with chickpeas, tahini, and a sultan chutney. Both spreads give new life to the basic Greek recipes. The tzatziki is topped with a bright pink pile of sweet watermelon that compliments the cool, cucumber yogurt perfectly and almost made me forget about the $7.00 price tag. While the house-made flatbread looks torturously delicious, Kapnos offers gluten-free patrons an accompaniment of lemon-sesame green tomatoes and kohlrabi, free of charge (unheard of in the gluten-free world). The crunchy vegetables are satisfying enough to be a dish all on their own. Left to my own devices, I would have ordered every dish on the very intriguing, predominantly vegetarian, left side of the menu. But alas, there was my dining partner to consider. 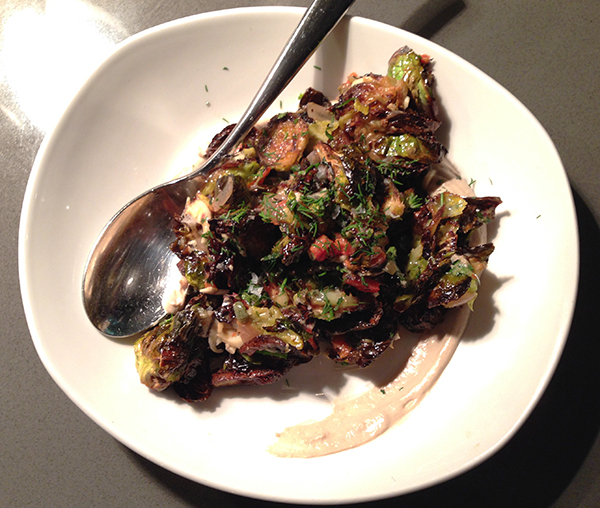 We stuck with the Farm House Vegetable Salad and Charred Brussels sprouts. From the right side of the menu, I ordered the signature wood-grilled, Charred Octopus with green harissa and eggplant, and Mr. Green Bean voted for the wood roasted, Marinated Spring Lamb with lemony potatoes instead of the ancient grain salad. 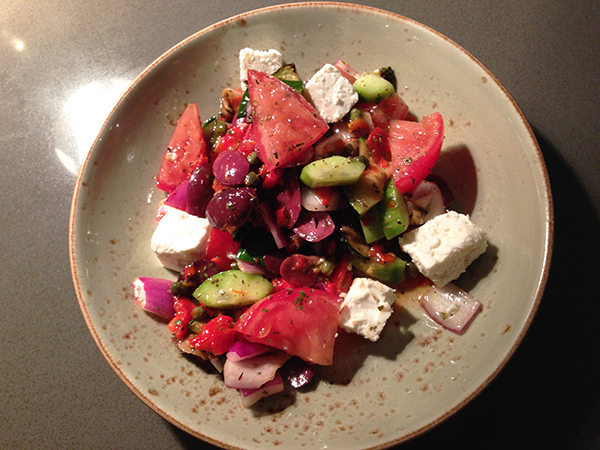 The farm house, or should I say “full house” salad, arrived first, packed with zucchini, cucumbers, tomatoes, peppers, onions, olives, capers, and large chunks of creamy feta cheese, tossed in a red wine vinaigrette. Mr. GB picked through the “foreign” objects to find all of the cucumbers and then pushed the bowl in my direction. 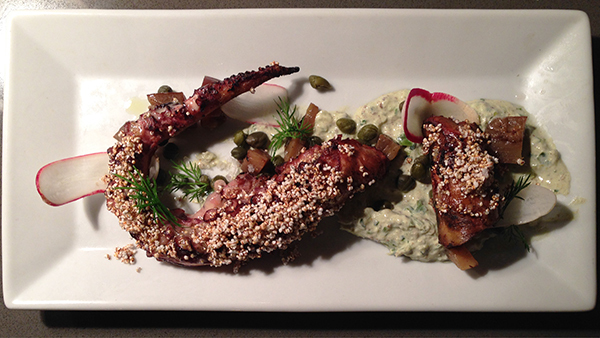 A large, hooked octopus arm covered in popped amaranth quickly took my attention away from our salad. It was almost too beautiful to cut through; I got over that quickly. The meat is the tenderest octopus I have had, accented by toasty grains that crackle in the mouth and a smokey, spicy eggplant purée. The chefs behind the counter and I begged Mr. Green Bean to try a bite, thinking this dish would surely convert him. Mr. GB argued that fried calamari is the closest he would ever come to grilled octopus, which the birthday chef took as a challenge. Moments later we were presented with a small plate of lightly fried octopus. Mr. GB tried it reluctantly and was polite enough to swallow. The charred brussels sprouts are prepared with black garlic, kalamata olives, capers, onion, red pepper, hearts of palm, mint, white anchovy, and a citrus vinaigrette. The dish bursts with salty and zesty flavors that match the brussels’ boldness. 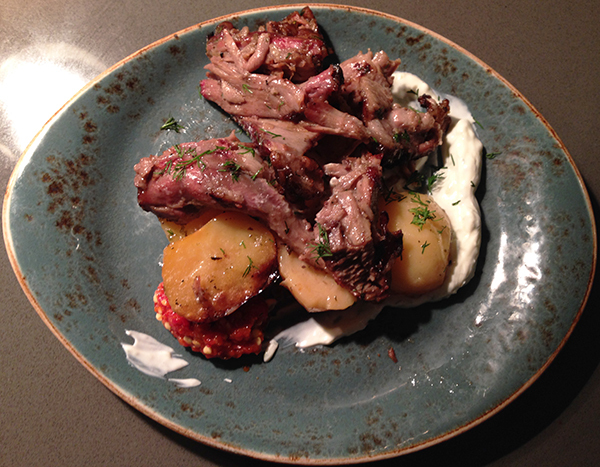 The marinated lamb is…soft as a lamb, and rich in flavor. Camouflaged fat might catch you off guard (and if you’re like Mr. Green Bean, turn you off). But there is no denying this hearty dish is cooked patiently and with love. We opted out of ice cream and sorbet (the only gluten-free dessert option), and headed home for a surprise final course of gourmet chocolates from Bryan Voltaggio’s Range candy counter, one of the few delicacies Mr. Green Bean and I can agree on. My impromptu birthday dinner pleased beyond my expectations. I look forward to trying Kapnos again for more unusual garden mezze, such as gigandes beans with onion seeds, bulbs, stems and flowers, and salsify with turnips, baby carrot, sweet potato and dates. More gluten-free friendly than Isabella’s American-Italian hot spot, Graffiato, Kapnos is worth the trip from north of U to Northern Greece. 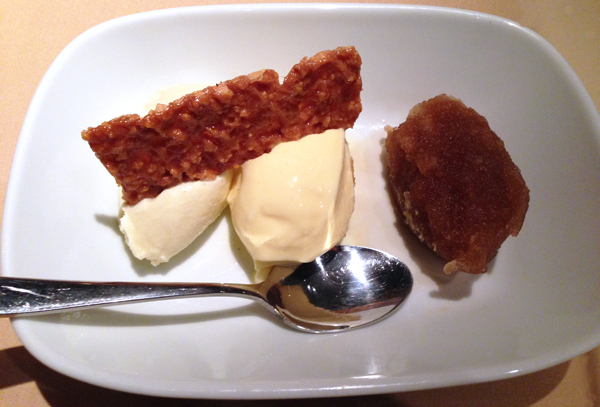 Categories: 4 Spoons, Dessert, Dinner, Gluten-Free, Greek, Mediterranean, Seafood, Small Plates, Vegetarian, Washington DC | Permalink. Cava is a permanent item on my grocery list. No, Mr. Green Bean and I are not popping the Spanish sparkling wine on a regular basis (we prefer Prosecco for cheap, bubbly thrills anyway). I’m talking about Cava Mezze’s variety of Greek-inspired dips and spreads, now sold at Whole Foods and other select grocers along the East Coast. This sounds like a paid endorsement. I promise it’s not. We just really love the stuff! It was one of Mr. Green Bean’s proudest moments the first time he returned home from a food shopping expedition with Cava’s traditional hummus in hand, like an accomplished hunter with a prized kill. Our friends can attest that dinner parties at our apartment always begin with a platter of Cava hummus and tzatziki, baby carrots and some variety of gluten-free crisps. 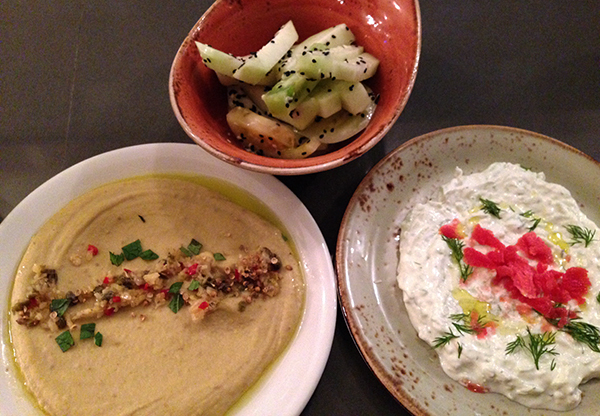 We were introduced to the spreads at Cava Mezze on Capitol Hill (now one of three Cava Mezze locations). It was one of our first dining experiences in DC. The hip, Greek tapas restaurant by trio Ike Grigoropoulos, Ted Xenohristos and chef Dimitri Moshovitis quickly became our go-to spot to bring out-of-town guests for reliable, quality food in a festive environment. 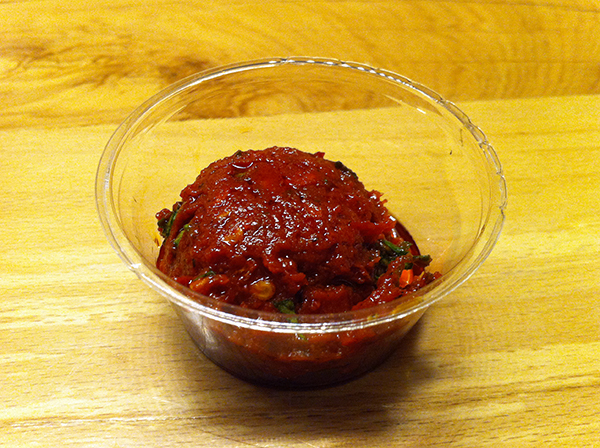 But where the Cava Mezze enterprise really succeeds is with their take home products and casual fast-food spin off Cava Mezze Grill. 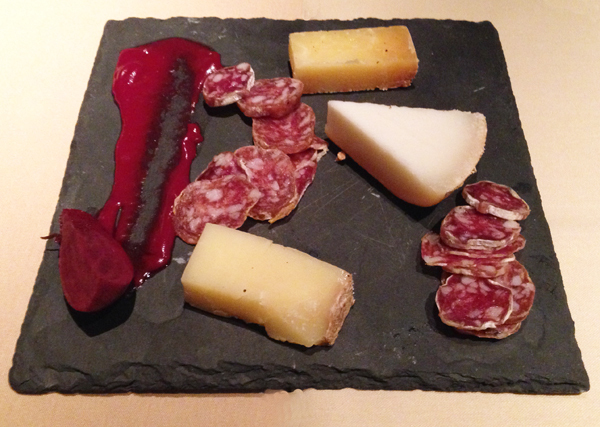 Cava opened its first grill concept on Bethesda Row in 2011. Mr. Green Bean and I frequently trekked from Cleveland Park until two locations opened in more convenient neighborhoods, Tenleytown and Columbia Heights. Doors have also opened in Virginia’s Tysons Corner (McLean) and the Mosaic District (Merrifield). Cava Mezze boils down their industrial-chic restaurant look for the grill’s more casual atmosphere with reclaimed wood surfaces and heavy metal detailing. The menu concept is familiar, thanks to Chipotle: start with a base and add dips and toppings of your choosing. The well curated selections from chef Dimitri’s oeuvre all play nicely together, making it impossible to mess up an order. A wall decal as you enter lists all of Cava’s ingredients with allergen information, breaking down which items are gluten-free, soy-free, vegetarian, vegan, etc. Gluties will happily note that most ingredients are gluten-free, save for obvious culprits such as pita, meatballs and falafel. 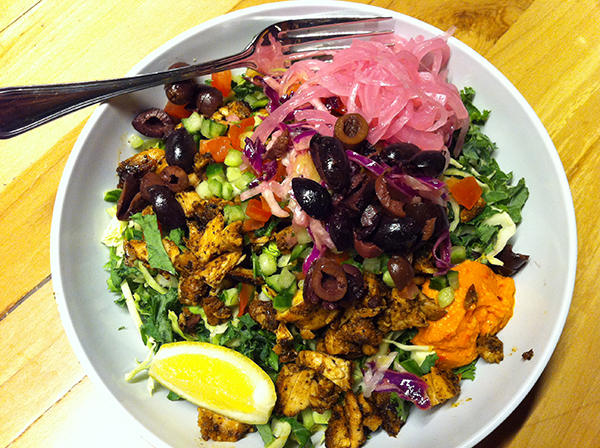 Power greens salad bowl with chicken and lots of toppings! Gluten-free diners can choose from a variety of greens for a salad bowl or a brown or white basmati rice bowl. The power greens mix, with shredded brussels sprouts, kale, and other crunchy leaves, starts the bowl off with a nutritious kick. Gluten-free protein options such as chicken, braised lamb and braised beef make for a substantial meal; but I am often just as satisfied forgoing animal meat. Those renown spreads and dips come next, with a choice of tzatziki, traditional hummus, red pepper hummus, jalepeño-infused “crazy feta”, eggplant/red pepper, and spicy harissa (which I cautiously order on the side). Lastly comes an assortment of chopped salads, pickled onions, olives, herbs and more. Dressings are available but the flavorful concoctions never really need more than a squeeze of fresh lemon. Gluties should be aware that while Cava Grill has the best intentions of accommodating gluten-free patrons with a variety of meal options and readiness to change gloves for an allergy, cross-contamination is a problem. Knives are used to spread the dips onto pita bread and placed back into the same bins that are used to scoop dips for the bowls. Food containers are closely packed together, making it easy for occasional droppings here and there. In part, the nature of an open preparation space reveals much of what happens behind the scenes at many restaurants. And fast-food is never the safest venue for highly sensitive individuals. But Cava Grill is certainly making an effort. 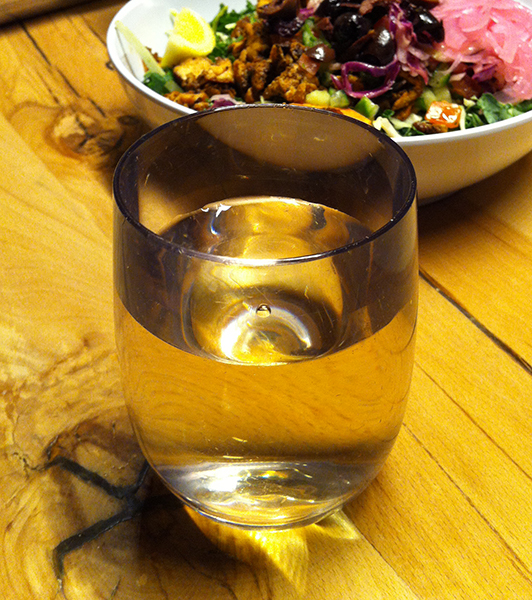 Any place where I can get a hearty salad, stat, with a glass of wine to wash it down, ranks high on my chart. Categories: 3 Spoons, Dinner, Fast food, Gluten-Free, Greek, Lunch, Maryland, Mediterranean, Vegan, Vegetarian, Virginia, Washington DC | Permalink.